The State University of New York Board of Trustees has designated School of Criminal Justice (SCJ) Dean William Alex Pridemore and School of Public Health (SPH) Empire Innovations Professor Joelle Welsh SUNY Distinguished Professors. 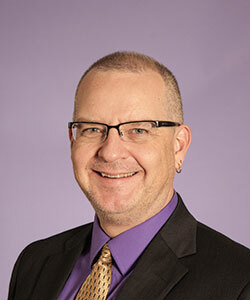 Pridemore, who earned his Ph.D. from UAlbany in 2000, has headed SCJ since 2015. He is internationally recognized for his research on the impact of social structure on homicide and suicide rates, the role of alcohol in violence and mortality, and the impact of the Soviet Union’s collapse on violence and health in Russia. Welsh, a professor in the Department of Environmental Health Sciences, is a pioneer in studying the role of Vitamin D in breast-cancer prevention and therapy. 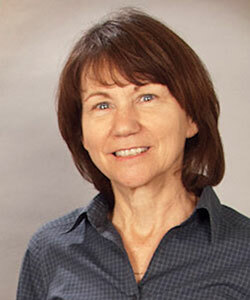 Based at the Cancer Research Center on the Health Sciences Campus, she joined the University at Albany faculty in 2008. The Distinguished Professor ranking is conferred upon individuals who have achieved prominence and distinguished reputations within their chosen fields. Their work also elevates the standards of scholarship both within and beyond their disciplines. Prominent AIDS researcher David R. Holtgrave joined the University at Albany March 1 as dean of the School of Public Health (SPH). He replaces former dean Philip C. Nasca, who retired in 2017. 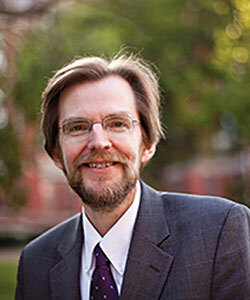 Holtgrave has been awarded a tenured faculty position as professor of health policy and behavior at SPH. He was also named a SUNY Empire Innovation Professor. Holtgrave came to UAlbany from Johns Hopkins University’s Bloomberg School of Public Health, where he served as endowed professor and founding chair of the Department of Health, Behavior and Society. 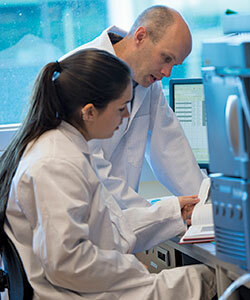 Previously, he led the HIV/AIDS research support division at the U.S. Centers for Disease Control and Prevention. A $1.9 million National Institutes of Health grant has been awarded to RNA Institute senior research scientist Ken Halvorsen. The Outstanding Investigator Award will support the work of the Halvorsen Lab in developing novel, user-centric technologies for the detection and single-molecule analysis of ribonucleic acid (RNA) – a vital class of molecules essential for all known forms of life. In 2018, the School of Criminal Justice marks its 50th anniversary with a series of special events both scholarly and social. The yearlong celebration will culminate with the anniversary gala in October. For updates about events related to this important milestone, please visit the Dean’s News page and the school’s website. 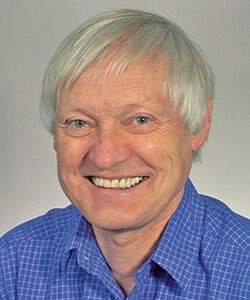 Joachim Frank, a Distinguished Professor in the University at Albany School of Public Health’s Department of Biomedical Sciences from 1985 until 2008, is one of three recipients of the 2017 Nobel Prize in Chemistry. The award honored Frank and his colleagues, Jacques Dubochet of Switzerland and Richard Henderson of the United Kingdom, for their work in developing cryo-electron microscopy, which both simplifies and improves the imaging of biomolecules. A professor at Columbia University since 2008, Frank maintains an affiliation with the RNA Institute at UAlbany. In 2018, the New York State Writers Institute celebrates two landmark occasions: the 35th anniversary of its creation and the 90th birthday of its founder, Pulitzer Prize-winning novelist and longtime UAlbany faculty member William Kennedy. To learn more about these and other events, visit nyswritersinstitute.org. President Rodríguez meets Sharinel Nunez, Nyasha Biggs, and Melick Lubin, the three UAlbany freshman recipients of the “Ellen” scholarship. 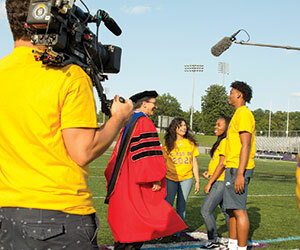 With help from talk-show host Ellen DeGeneres, three UAlbany students are fulfilling their college dreams on four-year scholarships. As part of DeGeneres’ “Summit” documentary series, and in conjunction with Walmart, all 42 members of the Class of 2017 at Summit Academy Charter School in Brooklyn, N.Y., received full scholarships to the SUNY schools of their choice. Walmart also provided each student an additional $10,000 for college-related expenses. Former Summit classmates Nyasha Biggs, Sharinel Nunez, and Melick Lubin are now freshmen at UAlbany. They and three other Summit graduates shared their impressions of their first months at school on “Ellen” last fall.